Most books on the Irish War of Independence and subsequent Civil War are not exactly ideal holiday reading material. It is to Terence O'Reillys credit that he has managed to write a massivly entertaining yet scholarly book on such a difficult and polarising subject matter, making it accessible to both those with a casual interest and substantial prior knowledge. O'Reillys manages to make all the main participants in the book human by placing their decision making in context. He is even handed to all of the protaganists, very few of whom come off as simply good or bad, heroic or cowardly. 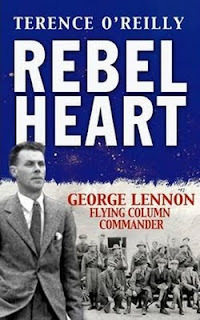 The book is primarily about George Lennon, the commander of the Flying Column in West Waterford but as Lennon was so deeply immersed in all things Republican that happened in Waterford between 1916 and 1923 it also serves as a fantastic history of the war itself. O'Reillys great triumph is demonstrating how effective the IRA campaign was in tying up a vastly superior British force and how heroic many of the Flying Column members were. Popular perception has it that Waterford was a reasonably quite County during the War Of Independence. O'Reillys extensive research into Crown Forces troop deployments and numbers disproves this quite catagorically. The new material he has unearthed from all manner of sources including unpublished personal memoirs, taped interviews, UK National Archives, National Library and many other sources brings much that is fresh and new to a story that I thought I knew. The second part of the book deals with the Civil War. Reading the book you get a sense of events spiralling out of control as the new nation plunges itself straight into a Civil War. The final part of the book deals with the latter years of George Lennon. You get a sense from the book that George Lennon always tried to do what was right (as he saw it) no matter how difficult the path may have been for him personally, he never shirked a decision. Towards the end of his life he became a Buddhist and campaigned against American involvement in Vietnam. The publication of this book should ensure that his memory will live on his native county for many years to come. I would be reluctant to say that any history book is 'definitive', new material is unearthed or a world view changes and a book can fall out of fashion. What I can say with certainty is that this book is as close to a definitive history on the War in Waterford that we are liable to get for some time. It is a fine biography of a fine man. The book is available to buy online from Amazon, it can also be purchased from Waterford County Museum. All copies purchased from the museum result in 7 euros going towards the museum upkeep.